Spicy chicken, teriyaki chicken, soy garlic chicken winglets and onsen egg topped on Korean white rice. Perfect don for chick chat sessions! Juicy chicken karaage topped on healthy multi grains rice that tastes as good as it looks alongside with fresh greens. Toss it thoroughly with teriyaki sauce! Indulge in spoonful grains of Korean pearl rice drenched in fragrant Korean curry topped with crispy chicken cutlet and fresh greens! Tender and juicy mooooo-gogi meat and onsen egg topped on Korean pearl rice. Mix the tobikko thoroughly to enjoy spoonful’s of crunchiness. Goes well with in-house bibimbab sauce! Thinly sliced seasoned sirloin steak with the right amount of tenderness is the star of this bowl! Topped on Korean multi grains rice and kimchi omelette. We love it with teriyaki sauce! Slightly poke that runny onsen egg to let it ooze and enjoy the creaminess of the yolk by mixing it with springy Korean glass noodles and well marinated spicy chicken. We love it with Korean BBQ sauce! Udon in soy soup can never go wrong. 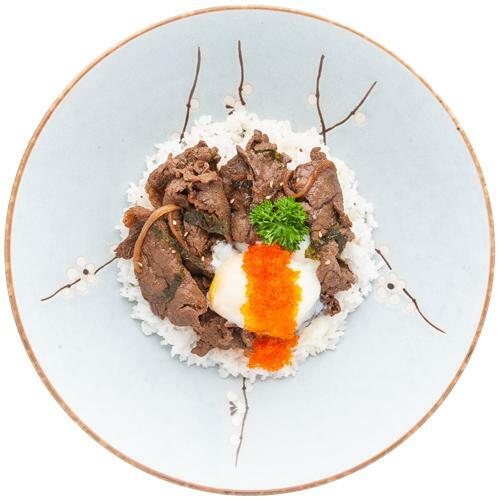 Enjoy marinated bulgogi and onsen egg with tobikko in a don. Best enjoyed on rainy cold days! We all crave for something soupy once in a while. Enjoy juicy chicken karaage and kimchi omelette top on udon in a piping warm bowl of traditional kimchi soup. Crunchy and chewy spicy octopus and kimchi omelette topped on fragrant Korean pearl rice. Toss it thoroughly with our in-house bibimbab sauce! Juicy ebi prawns coated and fried with bread crumbs wth that extra crunch. Topped on kimchi omelette and Korean pearl rice. Mix with bibimbab sauce for that extra #oomph! Brighten up your day with the right kind of food and right kind of colors! Enjoy juicy pan-fried salmon topped on multigrain rice with onsen egg. Mix the tobikko thoroughly for that extra crunchiness. We love it best drizzled with teriyaki sauce that complements the salmon to perfection. What can be better than a perfectly grilled piece of salmon. Topped on springy glass noodles, mixed salad and grilled salmon and is perfect with drizzles of teriyaki sauce. 1 Main + 1 Side + Soft Drink at $8!